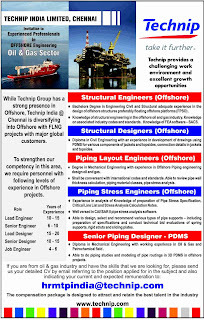 ♦ Bachelors Degree in Engineering Civil and Structural adequate experience in the design of offshore structures preferably floating offshore platforms (FPSO). ♦ Knowledge of structural engineering in the offshore oil and gas industry. Knowledge on associated industry codes and standards. Knowledge of FEA software - SACS. 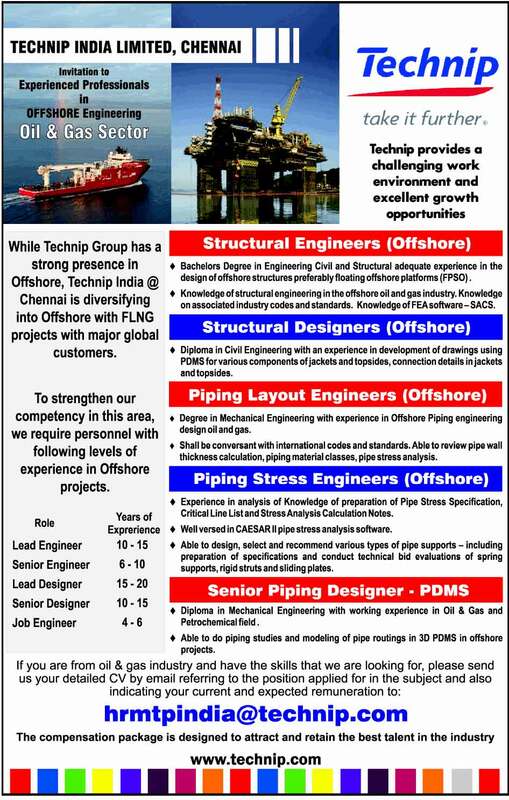 ♦ Degree in Mechanical Engineering with experience in Offshore Piping engineering design oil and gas. ♦ Shall be conversant with international codes and standards. Able to review pipe wall thickness calculation, piping material classes, pipe stress analysis. ♦ Experience in analysis of Knowledge of preparation of Pipe Stress Specification, Critical Line List and Stress Analysis Calculation Notes. ♦ Well versed in CAESAR II pipe stress analysis software. ♦ Able to design, select and recommend various types of pipe supports - including preparation of specifications and conduct technical bid evaluations of spring supports, rigid struts and sliding plates. ♦ Diploma in Mechanical Engineering with working experience in Oil & Gas and Petrochemical field. ♦ Able to do piping studies and modeling of pipe routings in 3D PDMS in offshore projects.